This page details the Miss Mississippi Teen USA titleholders who have competed at Miss USA or competed in Miss USA state pageants. Click here for a full listing of Miss MS USA & Teen USA titleholders. Five Miss Mississippi Teen USA titleholders have won the Miss Mississippi USA title, although none have placed at Miss USA. The most recent was Paromita Mitra (2009), who won the 2013 title on her second attempt. Mississippi has one of the highest rates of former Teens who return to compete in Miss, with all but two of their 2000s teens competing at Miss MS USA or in other states. 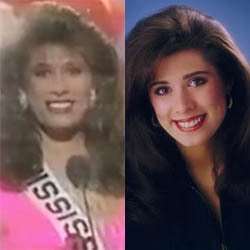 In a rare occurrence two consecutive former Teens, Angie Carpenter (94) and Meredith Joy Cash (95), were the final two at Miss Mississippi USA 2000. Angie won the title.